We had another fantastic, multi-tasking agility training session/play date with our pals the other day. Natasha’s dog, Polly, is one of those stereotypical, mellow and inherently well-behaved labs that everyone sees in the movies and on greeting cards. She is even-tempered and sweet, and will put up with pretty much anything from everyone, including the children. In conversation with Natasha, we were pondering the challenges of having such a dog with children, and this brought to mind the kids and dogs safety demo that I did at the C-DOG event this past weekend. Since developing the demo 8 years ago, it has, of course, undergone a number of improvements, but notably, I now find myself telling parents that the fact that they have dogs at home means that they may have to be more vigilant with their children than non-dog owning parents. This photo made my heart stop, and sparked discussion among colleagues. I so often hear of people with dogs that allow all manner of things to be “done to them”, even in spite of parents’ threats to children to leave them alone. Natasha mentioned how her older, male Labrador was harassed by children (under another parent’s supposed supervision) and. she went running to him when he barked loudly. She arrived to see him surrounded by harassing children who had been crowding around, poking and prodding him, while he sat quietly and took it until he decided to call for help. After an appropriate tongue-lashing to the parent of the children, Natasha thanked her lucky stars that her dog was so tolerant because, unlike many unfortunate parents, Natasha understands dogs, and knows what is appropriate, what is natural and normal, and what parents should NOT allow children to do to them. Within the various lists to which I belong, I often see photos that are downright shocking – people letting children kiss dogs on the noses, when said dogs are very clearly uneasy with the interactions. They are posted in the name of “cute”, yet those of us who are trainers and understand dog body language cringe when we see them. Shelby enjoys playing in the crates when the dogs are outside. I was at a park a few years ago and had my dogs on down-stays. They were patiently watching me as I watched and winced as a young child went right up to them and tried to pat them on the back. I ran toward him and stopped him before it happened, as his hapless mom told me “oh, he has dogs at home, so wants to pet them all.” What?? I couldn’t understand why she didn’t even try to stop him? And therein lies the curse – not all dogs are like “your” dog, and this is a tough lesson for a toddler. Heck, it’s a tough lesson that a lot of adults even have a hard time learning with, as anyone with a reactive dog who has endured dirty looks from others can attest. Just a short glance at the D.I.N.O.S. Dogs in Need of Space page will show you plenty of stories of such grown-ups, as well as a few children. Cursed though you may be, thank your lucky stars, and then get to work teaching your child how to properly behave around any and all dogs that are not part of the family. It could be a life-saver, not just for your child, but for someone’s beloved dog as well. Talking to my husband the other day, as we were preparing for an outing, I referred to my daughter’s diaper bag as her “gear bag”. I didn’t think twice about it until he asked in confusion to what I was referring. This got me to thinking about how similar much of the equipment is between the two, and also reminded me that some things can actually cross over. Following is a run-down of some of the items that are available for dogs and their corresponding children’s versions. 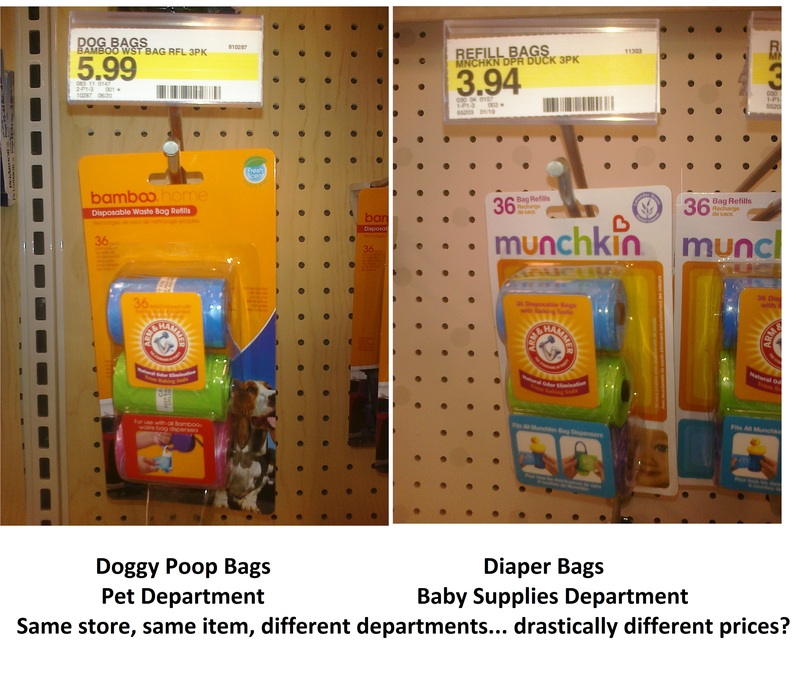 Poop bags / diaper disposal bags: We were shopping in a local department store some months ago, and had occasion to visit the pet department, followed by the baby department. While we were not looking for poop bags, I did notice them on the shelf. Then, in looking for diapers, we came upon the diaper disposal bags. The packages were nearly identical, with different label names on the top and – most interestingly – significantly different prices! My hot tip to all of my clients now is to buy dog poop bags in the baby section of their local department store. To save money on poop bags, get them in the kids' department! Kongs / “Baby kongs” – My friend’s blog turned me on to the fact that they do actually make feeding toys for babies! We all know that both children and dogs need plenty of mental as well as physical stimulation, and feeding toys are often a great way to achieve this mental stimulation with dogs. For the kids, the feeding toys are more about management (i.e. not spilling cheerios all over the floor), yet they will still spend plenty of time trying to figure out how to get their treats. 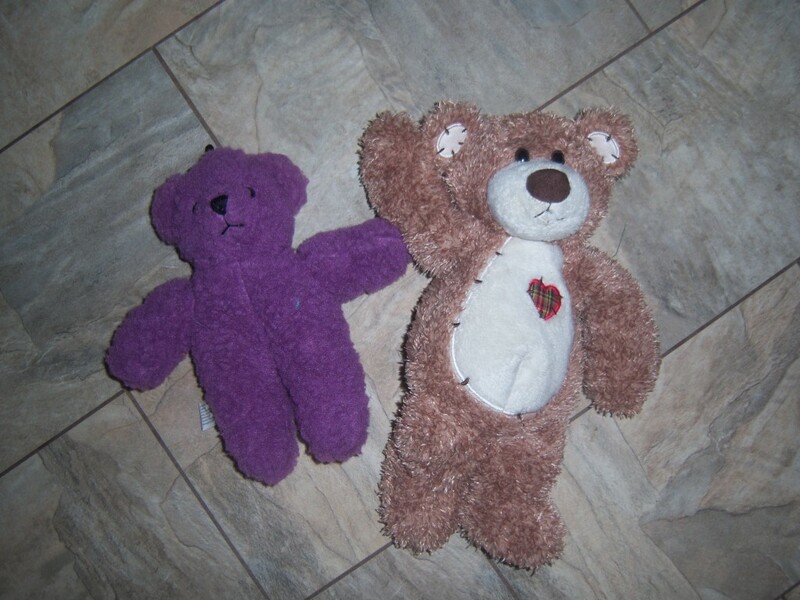 Toys – We all know that children’s toys and dogs’ toys are similar. I have clients who buy children’s toys for their dogs on a regular basis, and I have personally given dog toys to my daughter that we have won at dog sports competitions. (Actually, I tell her that they are from whichever dog won them.) And when it comes to safety, we look for similar traits: no removal parts that may be easily swallowed, non-toxic materials, and no sharp edges. Dog toy? Child's toy? Which is which? Sports classes – The inspiration for this group came at an agility trial, when I met up with another mom from my daughter’s Little Gym class. After we recognized one another, we got to chatting about classes and realized that not only do we train with our children in the same class, but we also trained at the same facility with our dogs. For either class, we each have our gear bags with all the relevant equipment, including drinks and treats. 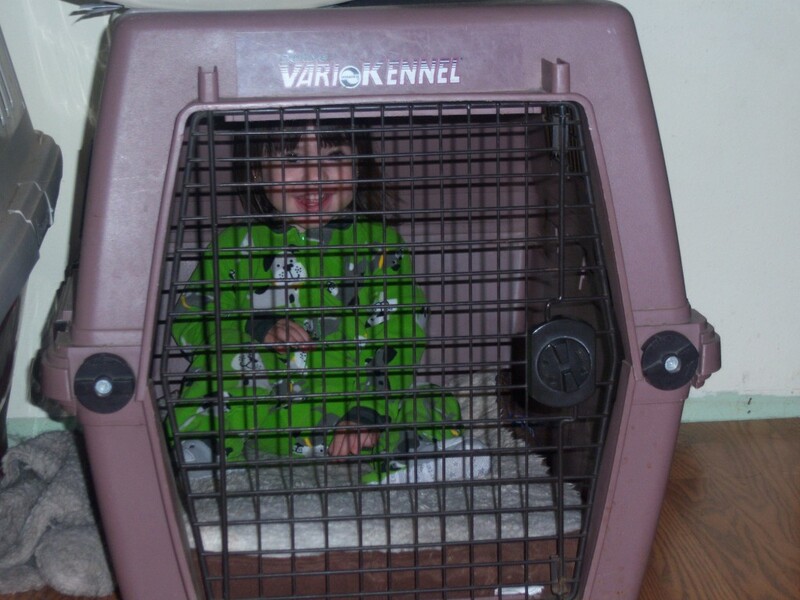 Crates and cribs – not surprisingly, the name of this group is also an area where dog equipment and children’s equipment can be very similar. At our first flyball tournament after Shelby was born, I walked into camp and asked “where should I put Shelby’s crate?” in reference to her pack-and-play. 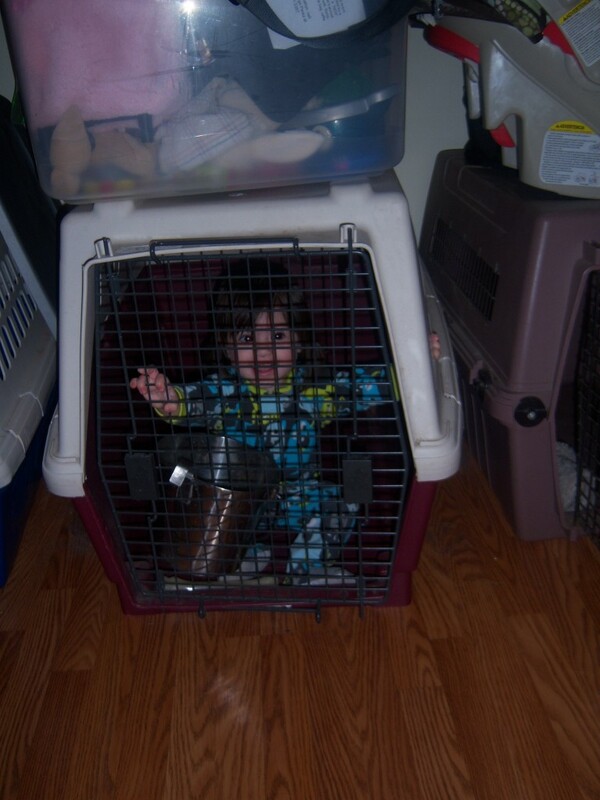 Many of my dog mom friends who later had children also similarly refer to their children’s cribs and travel equipment. 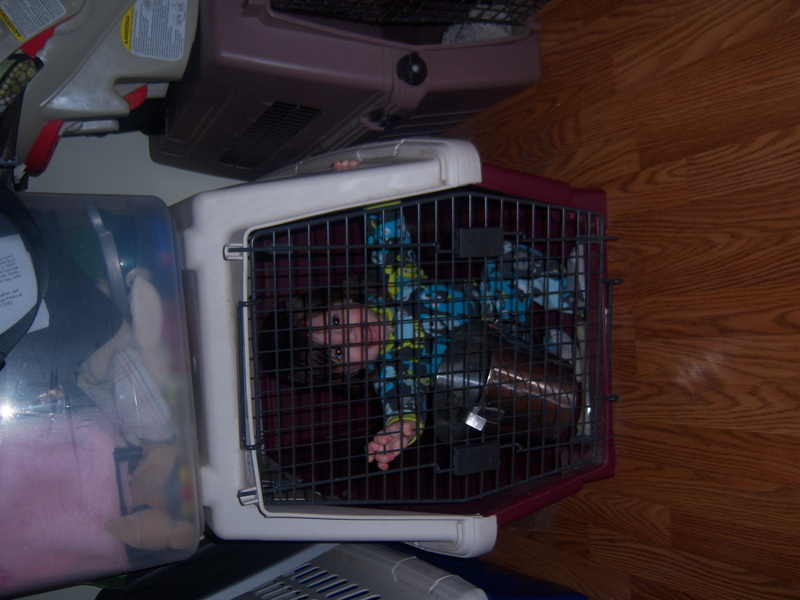 And after all, I’ve yet to meet a dog person who does not have at least one photo of their child happily in one of their dogs’ crates! I’m sure there are many other overlapping areas with regard to dog equipment and children’s equipment. Do you have any to add? 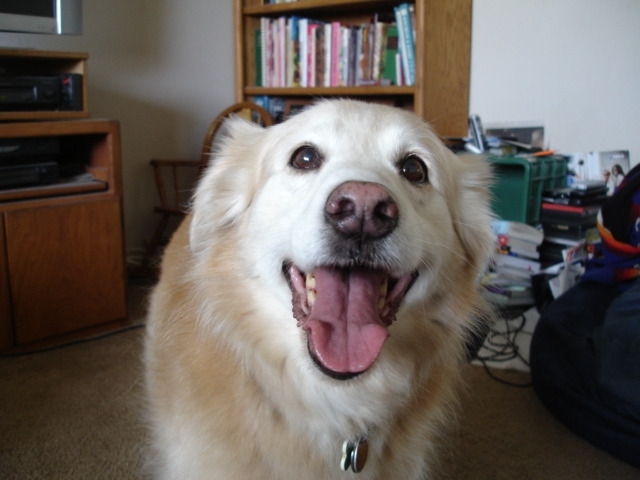 It is with a heavy heart that I write today, as we had to put down our housemate’s nearly 17-year-old beloved pooch, Gopher, or as my 2-year-old daughter affectionately called him, “Dofers”. I have known Gopher since he was 5 years old, when I first joined Pawdemonium Flyball Club with my then 10-month-old border collie, Claire. He was a spry and fairly fast runner then. Believed to be a golden retriever and border collie mix, we often called him the “fake Duck Toller”, as he looked very much like them, and loved water just as much. Over the years, I have grown to know and love Gopher, and for the past year or so I’ve had the privilege of getting to live with him. My daughter has also been growing up with him, alongside our three dogs and our housemates’ other border collie. Shelby loves dogs. She knows each dog’s name, including the dogs on our flyball team as well as the dogs of our various other friends. She enjoys giving them commands (under close supervision, of course) and tossing them cookies or toys or a tennis ball when they obey – which is most of the time. While Shelby has not inquired as to Gopher’s whereabouts yet, I’m trying to mentally prepare myself for that moment. One part of me wishes that we had allowed her to attend the euthanasia, to say her goodbyes and see him go. But as peaceful and loving of an experience as that was, surrounded by friends, I recognize that at just 2 years, she is too young for this. Yet, I realize that not addressing the question at all could be doing her an enormous disservice as well. When we were at the veterinarian, the doctor recommended that we try to help Shelby understand by relating to something with which she is familiar, such as a bug which has died, but since we have a turtle to whom we feed bugs, I decided quickly that although this kind of reference would be ideal for her level of understanding, it would not be an ideal explanation based on her experiences. My mother, a Licensed Marriage and Family Therapist, suggested telling her that “he is up in heaven (or in the sky) now”. According to The Association for Pet Loss and Bereavement, “bereavement in children too often has been trivialized or given inadequate attention”. On their very informative website, they describe the different ways in which children grieve, based on their ages and corresponding maturity levels. They recommend, at any age, being completely honest and telling the child that the pet has died and will not return. They also recommend that adults allow themselves to show their feelings of sadness to children in natural and normal ways, to help them better understand the process of bereavement. We have decided to tell Shelby that Gopher has “died and gone to heaven.” I’m sure that, like my niece who baked imaginary cookies and then tossed them skyward for my father after he passed away, Shelby will eventually understand what really happened. My goal is to prevent this moment from being traumatic in any way. My niece still mourns the loss of her beloved grandfather, but she does not seem angry at anyone about it, and while she wept at the loss of her hamster last year (her first pet) she was not visibly traumatized by this loss. Clearly, her lessons have been positive. In the end, we will do what we can to make this transition easy on Shelby, while helping her to understand what she can, based on her maturity level. Ultimately, our goal is help her to have as many positive learning experiences as possible. I suppose that, morbid as it may be, this may be another advantage to pet ownership for families. And, sadness notwithstanding, I would not give this up for the world.